“Through Christ Jesus the law of the Spirit of life set me free from the law of sin and death” (Romans 8:2). It’s the key to the whole Christian life. God always wanted to set us free. Whether we knew it or not, before we came to Christ, we were slaves to sin. That’s what Paul meant by “the law of sin and death.” We sinned because we couldn’t help it, and our sin was slowly killing us. The chains of sin were wrapped around our necks, choking off any possibility of knowing God personally. 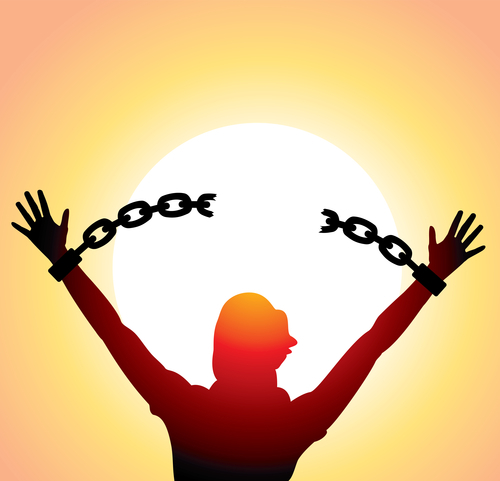 Through Jesus Christ those chains have been broken permanently and completely. The things that held us back—our old habits of life, our rebellious nature, our self‑destructive behavior, our anger and bitterness—no longer have the same power over us. When the Holy Spirit comes in, he brings new life with him. He replaces the old desires with entirely new ones. In place of the sin that dragged us down, the Holy Spirit begins to lead us to a brand‑new way of life. In place of the self‑destructive tendencies we once knew, he gives us a new moral compass. This change is radical, complete, instantaneous, and frankly, overwhelming for most of us. One writer called her experience of coming to Christ a “train wreck conversion” because it upended everything, including her closest friendships. It’s not easy to live one way for thirty years and then suddenly find yourself going in an entirely new direction. It’s like a criminal being pardoned after living on Death Row; he hardly knows what to do with himself. But the Spirit who gives us life is very patient. Having set us free, he teaches us how to walk with him, how to follow his leading, and how to experience “life” instead of “death” on a daily basis. If all this seems mysterious, remember this—We have been set free. The Holy Spirit has liberated us from our old lives. The chains have been broken. We’re free! Lord Jesus, help me to live as a free person and not as a slave to sin today. Amen. Musical bonus: James Taylor recorded a beautiful arrangement of Some Children See Him, a modern carol written by Alfred Burt. I found a YouTube version with pictures of children from all over the world. I include this song because we desperately need to hear its message in these troubled times.